Not to be confused with Jerry Reese (defensive lineman) or Jerry Reese (wide receiver). Jerry Reese (born July 22, 1963) is a former football executive and former player and coach. He served as the general manager of the New York Giants from 2007 to 2017. He was a member of the Giants organization for 23 years. He was inducted into the Tennessee Sports Hall of Fame in 2009. Reese is a native of Tiptonville, Tennessee, where he played for the Lake County Falcons' 1980 state champion 1-A high school football team. He played for the University of Tennessee at Martin where he was later an assistant coach before taking a job as a scout for the New York Giants. From 2002 until becoming general manager in 2007, he was the Director of Pro Personnel for the Giants. The Giants organization pictured in front of the White House on April 30, 2008. Reese succeeded Ernie Accorsi as general manager on January 16, 2007. He participated in the Giants' success in the 2007 NFL Draft, which included the selections of Aaron Ross, Steve Smith, Jay Alford, Kevin Boss, Michael Johnson, Ahmad Bradshaw, and Zak DeOssie. Some of them played important roles in the Giants' Super Bowl XLII victory. 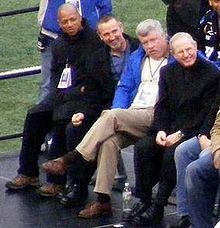 Prior to the start of Giants mini-camp in May 2008, Reese and the Giants were invited by President George W. Bush to the White House to honor their Super Bowl victory. Reese had his second Super Bowl victory in 2011 when the Giants won Super Bowl XLVI over the Patriots. In 2017, the Giants were marred by numerous player injuries and other known controversies. After a 2–10 record to start the 2017 year, Reese was fired by the Giants after serving 23 years in the front office, along with the firing of head coach Ben McAdoo. Reese is married to Gwen Moore. They have two children, Jasmyne Danielle and Jerry II. He resides in Jefferson Township, New Jersey, where his son J.R. recently played quarterback for the Jefferson Township High School football team. ^ Shields, Brandon. "New York Giants GM Jerry Reese discusses NFL recruiting". The Jackson Sun. Retrieved August 9, 2018. ^ "Jerry Reese-Tennessee Alumnus". Tennessee.edu. Retrieved August 9, 2018. ^ "New York Giants fire coach Ben McAdoo after 2-10. Jerry also managed to waste the talent of Eli Manning and screw Tom Coughlin over with his poor drafts and horrible free agent signings. This is the reason the Giants are in salary cap hell. start". NFL.com. Retrieved December 4, 2017. ^ Hague, Jim. "Falcons end grid season on high note with win over Lodi", Aim Jefferson, November 19, 2010. Accessed March 29, 2012.